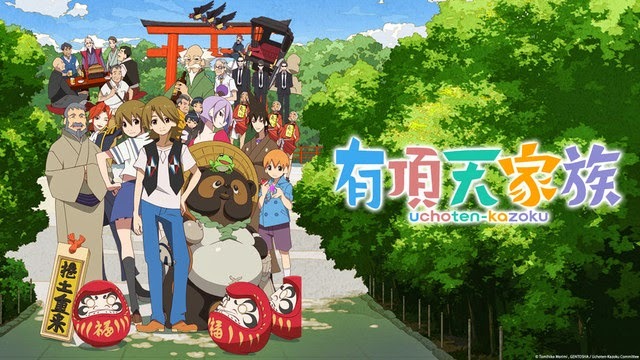 Lilac Anime Reviews: Lilac, The Five Point Podcast, and The Eccentric Family! Lilac, The Five Point Podcast, and The Eccentric Family! Hello one and all! You may or may not be confused right now, but I'm gonna straighten things out. This isn't my biweekly review, no. That's in a couple days. Recently, I got the chance, once again, be be a guest on the Five Point Podcast with Bobcat (Burk's computer has sadly kicked the bucket, so I offered to help out until that problem is fixed). He let me pick what we would watch and, since I always have my own reviews on the brain, I picked out The Eccentric Family! I will have a full review of the series later this week, but just consider this my first impressions of the series. Kinda like a precursor to the full thing, ya know. Also, please go and check out the guys at Five Point Podcast! They are awesome and would love the support! You can check out their site here! Now, enjoy the podcast!